Students and faculty from across several departments, including Latin American Studies, Spanish, and Studio Art, gathered in Gregory Hall on Thursday to learn more about Latin American art and political murals. Fabián Cereijido, who holds a Ph.D. from University of California San Diego in Art History, Theory, and Criticism, opened the evening with a lecture about the history and politics surrounding Latin American art, describing how during times of political instability in Chile and Argentina, muralists convinced people to come out of their homes in order to paint as an act of resistance and empowerment. Camilo Díaz, an art student who paints with the Luchador Ernesto Miranda Muralists (UMLEM), followed by presenting the murals he has crafted at schools and community centers along the West Coast, from L.A. to Seattle. The messages in these murals have ranged from supporting undocumented workers to encouraging children to embrace their cultural identities. As Díaz explained (with Cereijido translating), UMLEM’s workshops involve first identifying a significant struggle of the participants, and then providing a tool—drawing and painting skills—that the participants can take away. Díaz uses simplistic, geometric shapes in his murals to allow everyday people to learn the art style. 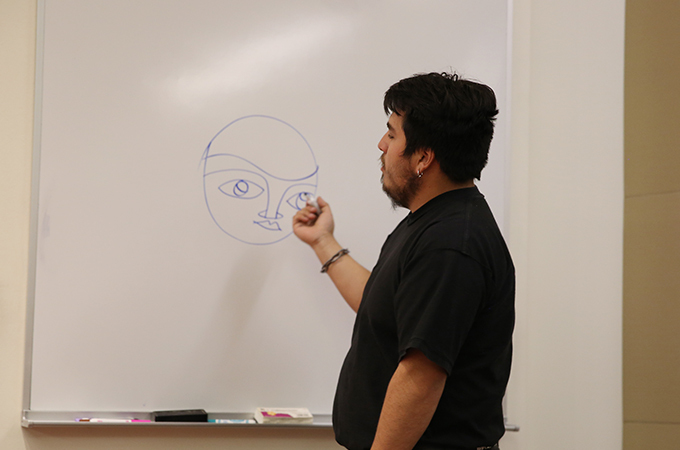 To prove just how easy it is to learn the style, Díaz gave a quick demonstration, starting with a “Pepsi logo” and adding semicircles to complete the face of a girl.